Using alignment equipment and the manufacturer's instructions, measure the camber settings. 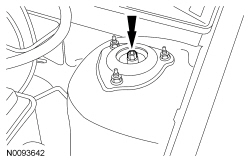 By loosening the strut rod nut and either pushing the strut inboard or pulling it outboard the camber can be adjusted by approximately 0.25 degree. Loosen the strut rod nut. To make a negative camber adjustment, loosen the strut rod nut and push the strut inboard. To make a positive camber adjustment, loosen the strut rod nut and pull the strut outboard. Tighten the nut to 90 Nm (66 lb-ft). 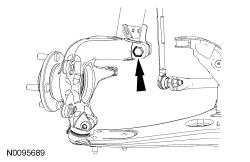 To make a positive camber adjustment, loosen the wheel knuckle-to-strut bolt with the vehicle supported by the subframe. This will allow the strut to sit on the wheel knuckle-to-strut bolt. Tighten the bolt to 150 Nm (111 lb-ft). To make a negative camber adjustment, loosen the wheel knuckle-to-strut bolt with the weight of the vehicle on the wheel and tire. This will allow the struts weight to fully lift up on the wheel knuckle-to-strut bolt. Check and if necessary, adjust the front toe. For additional information, refer to Toe Adjustment — Front in this section. 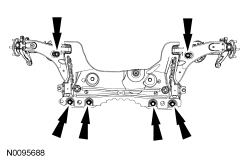 Loosen the 4 subframe rearward bolts and the 2 subframe forward bolts approximately 2 or 3 turns (720-1080 degrees of rotation). Shifting the subframe towards the passenger side will increase the driver side camber and decrease the passengers side camber. Shifting the subframe towards the driver side will increase the passenger side camber and decrease the drivers side camber. Shift the subframe to change the cross camber as required. Tightening the subframe bolts in the correct sequence will minimize subframe shifting. 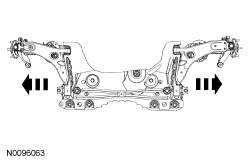 Tighten the 6 subframe bolts in the following sequence. Tighten the 2 rearward outboard bolts to 175 Nm (129 lb-ft). Tighten the 2 forward bolts to 103 Nm (76 lb-ft). Tighten the 2 rearward inboard bolts to 175 Nm (129 lb-ft). Using alignment equipment and the manufacturer's instructions, measure the caster settings. Shifting the subframe forward will increase the caster. 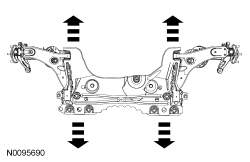 Shifting the subframe rearward will decrease the caster. Shift the subframe to change the cross caster as needed.